Grandin Properties announced today that it is pushing sustainability to a new level with its development of the 88,000 square foot Strietmann building. The Strietmann is located in OTR on W. 12th next to the new Shakespeare Festival Theater and within steps of Music Hall and Queen City Radio Beer Garden. To begin, HGC client, Grandin Properties, is the first commercial company in Cincinnati to install rooftop solar. They are investing over $600,000 in solar panels, new roof and structural improvements. It will provide enough power to supply the most of the needs of the core and shell. It is a long term payout but something the people of Grandin Properties believe in. “We are committed to improving our community and hope our pioneering move will be a model for others,” stated CEO, Peg Wyant of Grandin Properties. The system is expected to produce approximately 61,000 kWh per year. To put that in perspective, it will deliver enough power to provide the annual electricity needs of 5 single family homes. Second, the Strietmann was originally constructed in 1899. An often used phrase is “the greenest building is the one that’s already built,” which succinctly expresses the relationship between preservation and sustainability. Wyant noted that “bringing a historic building back to life is considered by many to be the ultimate recycling project” and we agree. Third, the building is pursuing LEED Silver Certification using the Core and Shell Rating System and we fully expect to earn that rating. The building’s close proximity to the Cincinnati Bell Connector streetcar and other public transportation make its location ideal for several LEED credits. According to LEED consultant Allison McKenzie, “the project has abundant daylight and will focus on the use of low VOC materials and finishes to make it a healthy environment for building occupants.” There will be bike racks as well as showers for bikers and jokers. Many of the windows are operable. Importantly, the building itself is poised to be the office of the future. With 15,000 square foot, open floor plates and ceilings as high as 14 feet, it is perfectly suited for companies that recognize that working no longer means working only at a desk. Strietmann’s square footage is likely to focus more on a range of areas for collaboration, spontaneous interaction, quiet work or taking a break than just personal space. 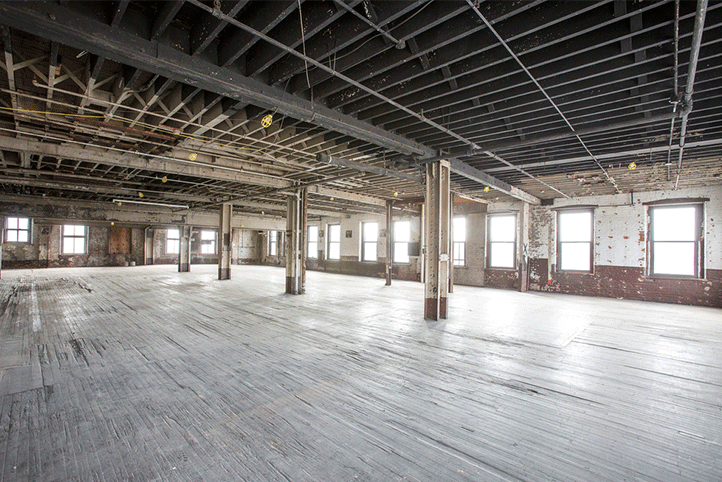 Cost per cubic square foot for tenants is OTR’s lowest for Class A space. Plus it boast huge beams, arched windows, exposed brick as well as a top floor “Penthaus” and Rooftop Terrace with spectacular views of the Central Business District, Union Terminal, Washington Park and all surrounding landmarks. This is the essence of what draws creatives, millennials and entrepreneurs. Birthplace of the iconic Zesta Crackers brand, the Strietmann Biscuit Company was established on a “foundation of optimism and belief that the world was getting better.” Grandin Properties is committed to preserving that idea. HGC Construction and Sun Rock Solar LLC, as a part of the renovation on the Strietmann Building for Grandin Properties, will install the roof top solar array covering over 50% of the roof deck area. The installed system will consist of 144 solar panels and the power will be used to offset the building owner’s electricity needs for lighting, heating and air conditioning, as well as other common area electrical needs. The REC solar panels are 72″ x 40″ in size and are rated at 315 watts of power output. The solar panels themselves produce DC electricity but the building uses AC electricity. Rooftop inverters will convert the DC power from the panels to 480/277 volt power used by the building.